This stag-horned god of Celtic Europe represents the masculine spirit of the primal forest here rendered in fine Bronze. 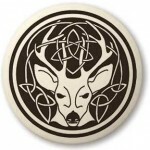 This stag-horned god of Celtic Europe represents the masculine spirit of the primal forest. This image is reproduced from the G'ndestrup Cauldron found in a Danish peat bog, ca 1500 BCE. Meticulously crafted in bronze, this image of Cernunnos celebrates the primal power of male energy in our lives. It measures 1 1/2 inches high. From the most ancient times of prehistory comes the archetype of the Horned God of the forest and the hunt. As long ago as 14,000 BCE on the wall of the Cave of the Three Brothers in France, his image looks down on us in the form of an antlered shamanic cave painting. 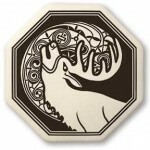 His origins as the bringer of good fortune on the hunt are echoed in images through the ages. He is portrayed on a rock carving from Val Camonica in Northern Italy standing with his companions: a horned serpent and a male worshipper. It pre-dates a combination of identifying features 'antlers, torc, horned serpent and other animals' found in a later period. Most later images of Cernunnos show his seated in a kind of half-lotus position familiar to yogis. 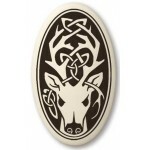 His name has come down to us, even though many names of the other Celtic gods and goddesses have been lost, because a stone relief carving was unearthed in Paris showing the God with antlers, on each of which hangs a torc. The name Cernunnos is carved in Roman letters; it means literally 'The Horned One.' Another famous Gallo-Roman image shows a bearded Cernunnos wearing a mantle and torc holding a large sack of coins which flow downward in abundance; standing beneath his is a stag and bull and above him is a rat. By far the most famous image of Cernunnos is this one from an inner plate of the Gundestrop Cauldron where he appears in his aspect as Lord of the Animals. In his left had he holds the ram-headed serpent, on his right he holds the magical torc. He is flanked by a stag and a bull on his left and by boars and mythical creatures to his right, including a man riding a dolphin. Embossed ivy leaves surround the god and his creatures. This lovely statue is based on the Gundestrop Cauldron image rendered in cold cast resin and hand finished, he stands 7 1/2 inches high. Item Number: MT-CERNBRZ | Approximate Size (Inches): 0.25 wide x 0.25 deep x 1.50 high | Approximate Shipping Weight: 0.25 lbs.